← Most People . 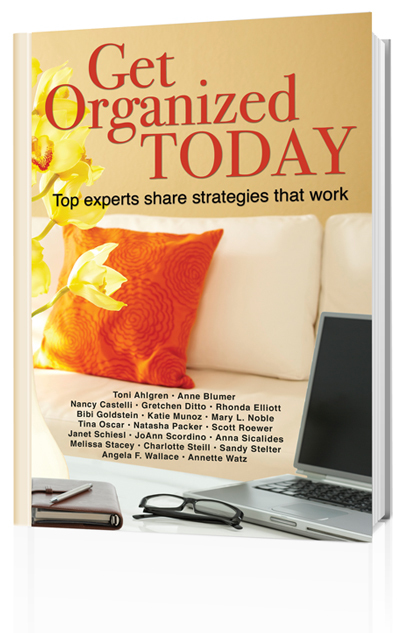 . .
Get Organized Today Give Away! Would you like a copy of my book? A collaboration of many professionals, to provide inspiration that affirms the power and importance of getting organized. The book provides practical ideas that you can use immediately to live a better, more effective life. Look for my chapter “Staging Your Home – Transforming Your Space to Eliminate Clutter and Fit Your Lifestyle”. Be the first person to comment on this blog and you will receive a free copy! This entry was posted in Inspiration and tagged Get Organized Today, Give Aways, Products. Bookmark the permalink. 2 Responses to Get Organized Today Give Away! I would love a free copy of your book. I enjoy reading your emails. I live in a 2 BR townhouse…with 4 other people! Eeeek!! I try to organize as much as possible and look for multiple resources to help me. Thanks so much for all of the knowledge you so willingly share! Melinda, you win the book! It sounds like you have an organizing challenge, with so many people in a small space. I will email you separately about getting you a book.